Let’s talk about some more inspiration for my master bedroom makeover. 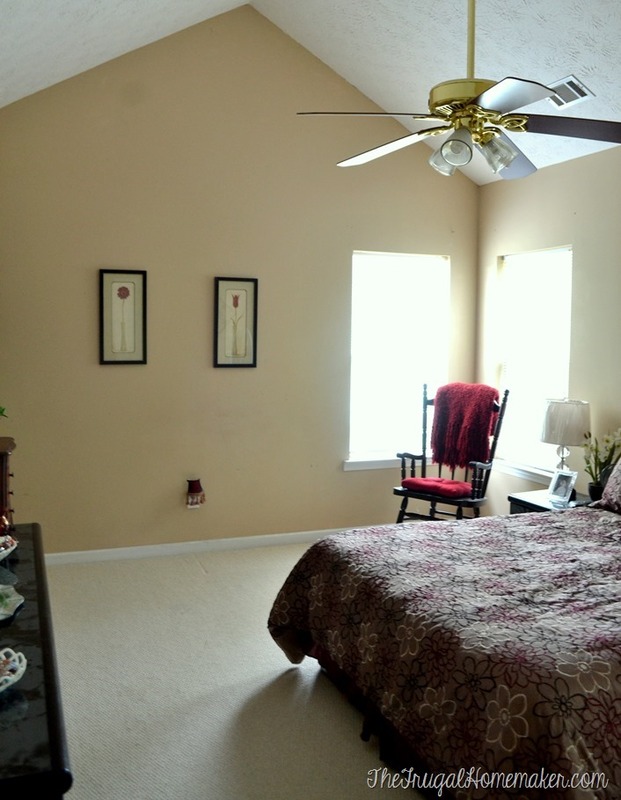 If you missed the previous posts you will want to go back and see all the before pictures and also see the first inspiration post where I talk about wall color, curtains, headboard plans and more for the room. Today lets talk about the space in the room in general, art ideas, what I want to do with that weird little nook, and some furniture ideas. I pinned this picture from HGTV a long time ago because the layout of the room is so much like mine! My shot of my room is not as wide but I have windows on both side of bed just like theirs, a door to the bathroom on the opposite wall, a long flat wall across from bed where a dresser or hutch can go. I am not sure if I will room for a chair to go there next to long dresser but I would love to do that if I can! 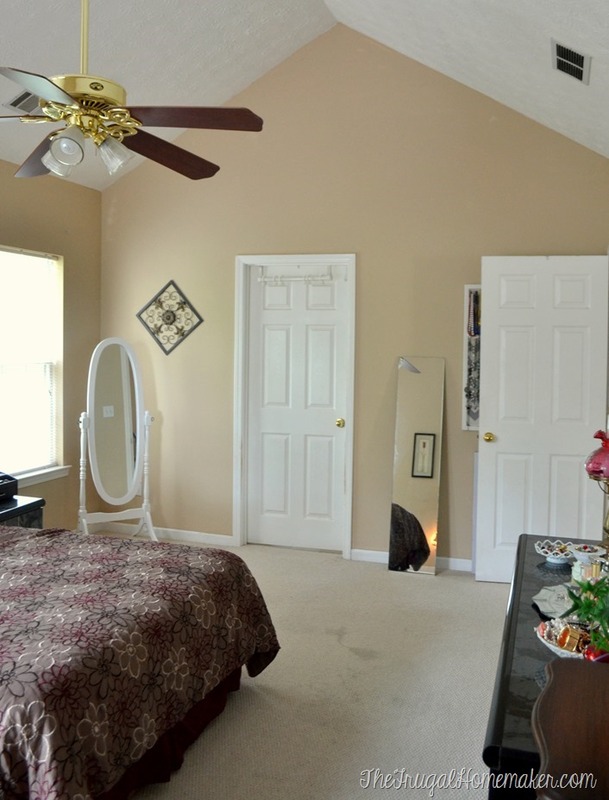 And I also plan on putting our tall chest dresser in that corner between the window and bathroom door. So there’s some furniture placement ideas. Now that weird little nook in the room that I so lovely have cluttered to death right now. I have been brainstorming some ideas for this area and pinned quite a few more pictures on Pinterest. This would be the easiest option. 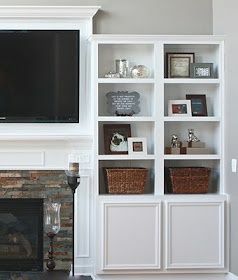 Rearrange and add some more shelves all the way to the floor and frame up a bottom shelf so the bottom is not just carpet like it is now. I love this look for an office (which is what Just a Girl did it in) or even a living room but for a bedroom, I just don’t think you need to or have to have open shelving all the way to the floor. Some of you asked about or mentioned did I need the space for extra closet space. We have a walk-in closet off the bathroom so don’t really need more closet space for clothes Although who doesn’t need more storage space!! So I could easily use more space to store other things – extra décor, extra bed linens, throw blankets, accessories like scarves, belts, hats. So I would like to have some baskets and bins on those shelves where those things could be stored. What I would really like to do which would create some closed storage (i.e. hidden/doesn’t have to be perfectly organized!) and fix the issue of shelving all the way to the floor looking awkward is to put a cabinet on the bottom. So that’s the plan and I am scared you guys! There is no tuturial on Pinterest for this and no specifics to copy since my space is so unique! It is going to take a lot of planning, measuring, trips to Home Depot and maybe even some tears as I try to figure it out. I will need to frame up the floor, frame out the walls for the cabinet part, build cabinet doors, figure out how I am going to do my hinges, then reinstall more shelving on top of the DIY cabinet, rearrange the shelving on the rest of the unit, then I want to add a pretty frame of trim around the whole thing, reinstall the baseboard to go in front of the cabinet and meet on the other wall, caulk, and paint. I am looking forward to the caulking and painting part! If it is just too complicated or too time constrictive, I will just frame out the floor, move the baseboards, trim around the whole nook, then paint. And will find some large matching baskets to go on the bottom shelf like this. What would you do? Cabinet and shelves or just shelves? Complicated or easier? Here’s the yard sale set of furniture that I picked up last year – all of it for $40.00! 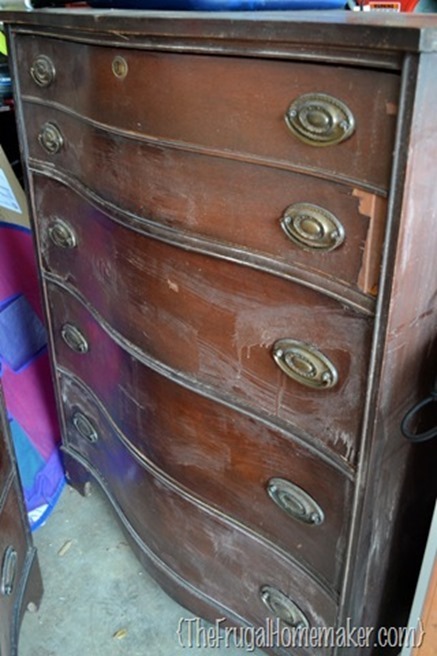 It is filthy dirty, needs to be refinished, and 2 of the drawers on the top chest have veneer that needs to be repaired. I worked on that last week and it is almost done and turned out great! So I originally had wanted to try to sand/strip the furniture and stain it with dark walnut stain. The tops sanded fine and are gorgeous, BUT the sides have these small pieces of trim with ridges on them that I will never be able to sand – they would need to be stripped with chemical stripper. I tried Citristrip last week and it just isn’t taking the stain off – the wood is still died a color. SO… now my plan is to stain the tops and paint the bottom or stain the tops and drawer fronts and paint the base. 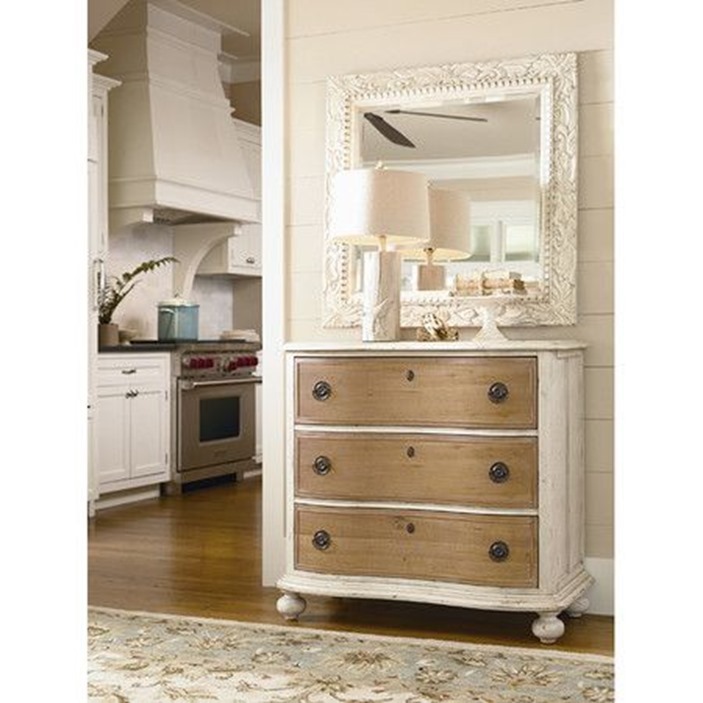 I am thinking dark stain for the top, leave the hardware, and white distressed on the bottom like this. 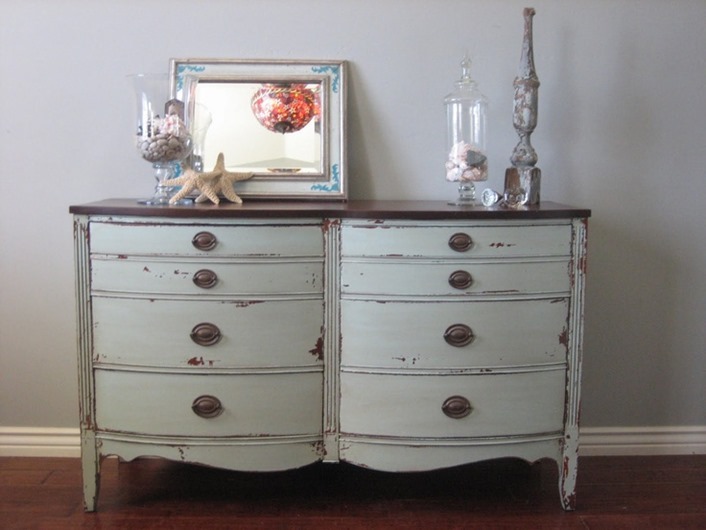 This furniture from Southern Revivals is not the same style as mine but would do this same paint style on mine. 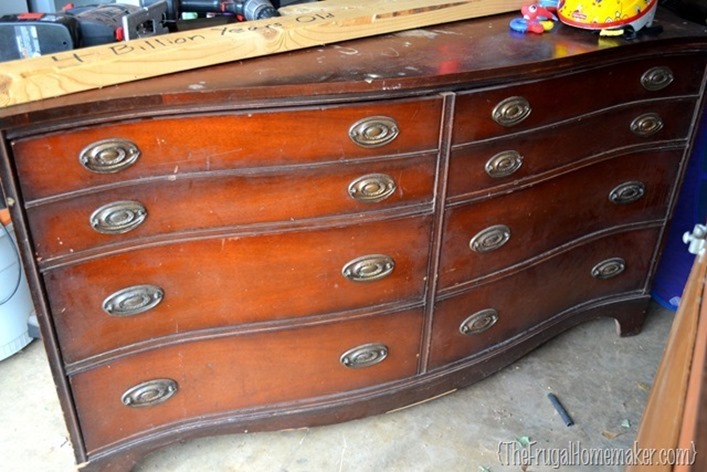 The other look is to stain the front of the drawers too. 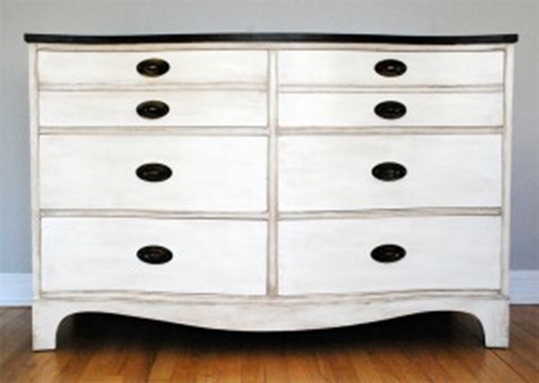 Like this chest from Joss and Main. Oh, and nightstands – only one came with that set. SO I either have to find another similar nightstand or find a set of matching nightstands. Which I haven’t done yet but I am looking every night on Craigslist, facebook sale sites, and of course yard sales and thrift stores. 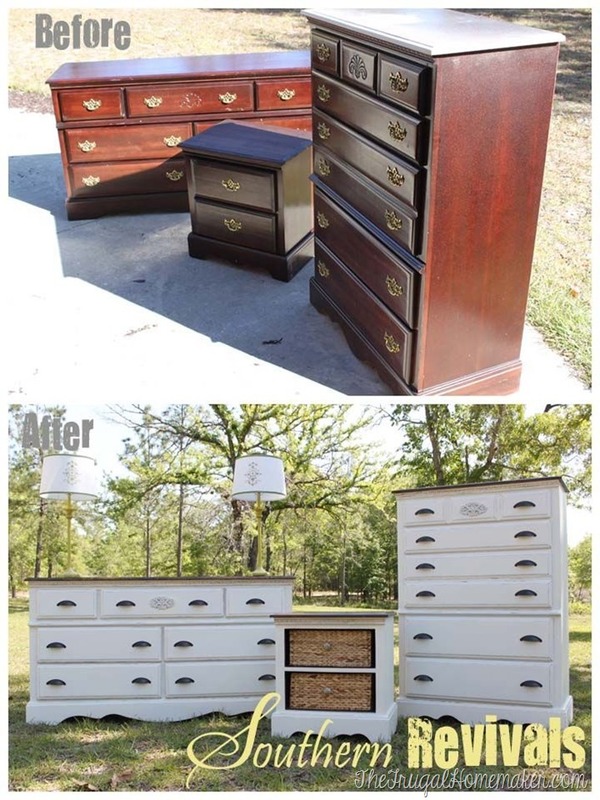 I may do something temporarily with an old nightstand I have in the garage and the matching one that came with the set until I can find what I want. Lastly let’s talk art. I hope to put a gallery wall on this large wall. Something like this but not square shaped – with wedding pictures, some DIY personal things commemorating dates, etc. and some decorative pieces like letters, etc. 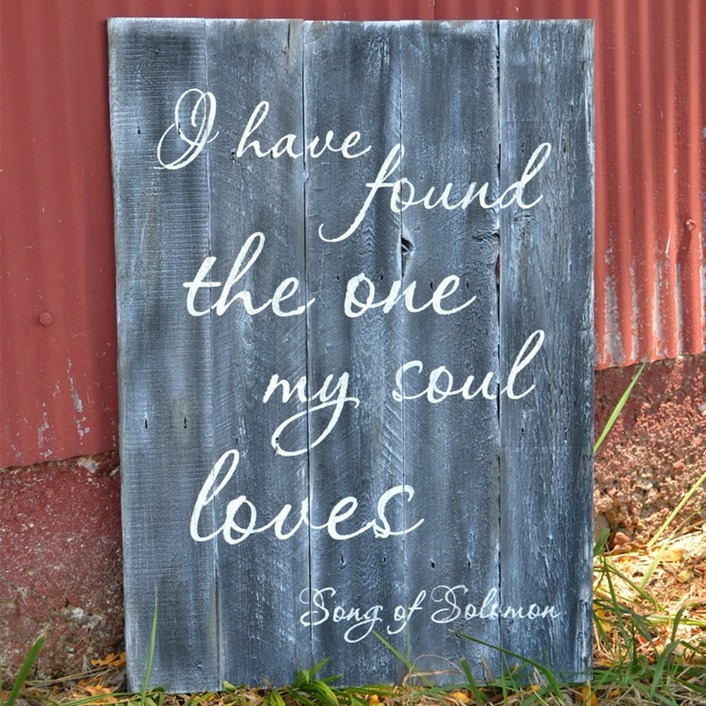 I would also like to make a DIY art piece something like this with either this saying or another saying like it. BUT all of that will be decided once walls are painted, furniture is in and I see what space is left and what would work best. Those are just some ideas of things I like! 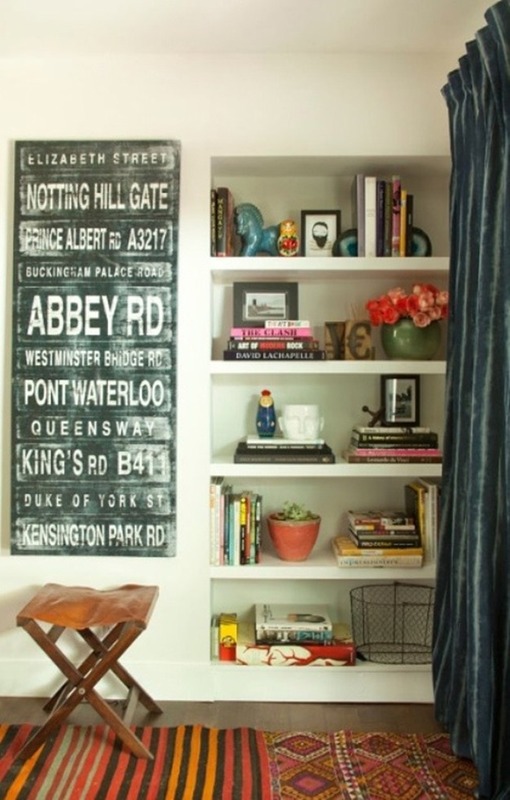 And you can find even more ideas on my Master Bedroom Pinterest board. So I would love to hear your thoughts! What would do with the nook and what would you do with the furniture? Hoping to show you some progress on the furniture, paint or nook next week! Thanks so much for sharing! I love that furniture! I can’t believe you got it all for $40. That’s amazing! I can’t wait to see what you decide for it. It will look great no matter which you choose! Hi Christina, such an exciting project! Here’s my .02 🙂 I commend you for trying to create a built shelf/cabinet unit from scratch. I’m not that brave yet! I would attempt to find a cabinet that would fit the bottom (maybe 2 skinny kitchen cabinets? you may be able to find them for nothing at the Restore) and trim and paint so it all looks cohesive, similar to this: http://www.younghouselove.com/2014/02/top-o-the-built-in-to-ya/. If that’s not an option I would definitely go the easy way and add shelves top to bottom with baskets; I love how they add an organic element to the decor. I recently took a $6 estate sale side table and painted it using the lightest shade in the same paint card as my wall color and re-stained the top. It looks white from a distance but up close you get the hints of blue and I think it looks very pretty. Plus, I can always repaint it! If you’re aiming for a darker wall color that might work for the dressers, but you can’t go wrong with white either. I would do the stained top with the rest painted and also get some new hardware. There are so many cool, inexpensive options out there now and it would give the vintage furniture a twist (such an amazing deal btw!). Since you only have one night table, I would look for a matching set that’s different from the rest of the furniture. Frankly, they don’t even need to match if you have matching table lamps and they are of equal/similar height but I think that’s a matter of what you prefer/lets you sleep at night 😉 Can’t wait to see where you end up; it’s going to be an amazing transformation! I love all of your inspiration ideas! For the nook, I like the cabinet doors – the look as well as the fact it can hide that extra clutter, as well as provide storage space. However, that sounds a little labor intensive! :0) If you could find the right size large basket, I think that would look great there, especially if it were one with a lid that could provide storage and privacy. 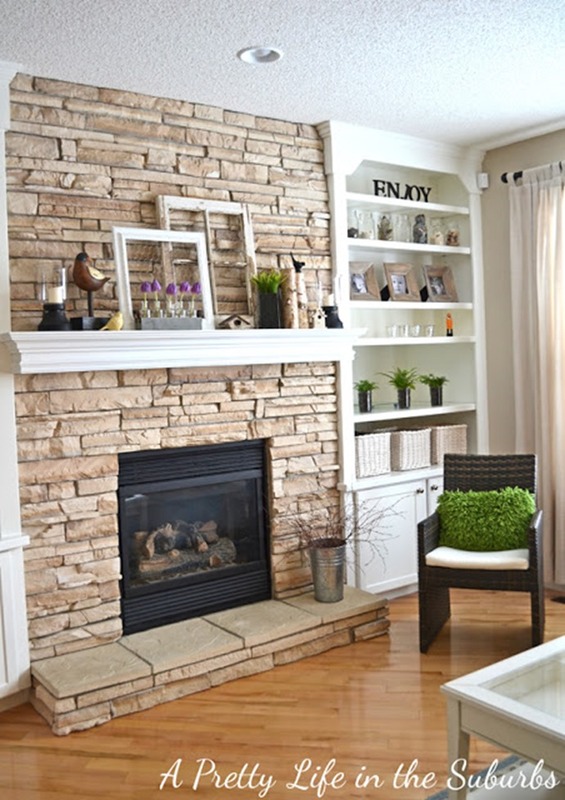 I LOVE your idea of the gallery wall and can’t wait to see what you come up with! I’ve been posting several pictures of those from Pinterest. As for the furniture, I like the dark stain on top and painted white, especially sine you are going with dark gray walls. Whatever you do, keep the hardware! Looking forward to how it all turns out! cant wait to see the big reveal! it will look just fantastic- love the inspiration pics! 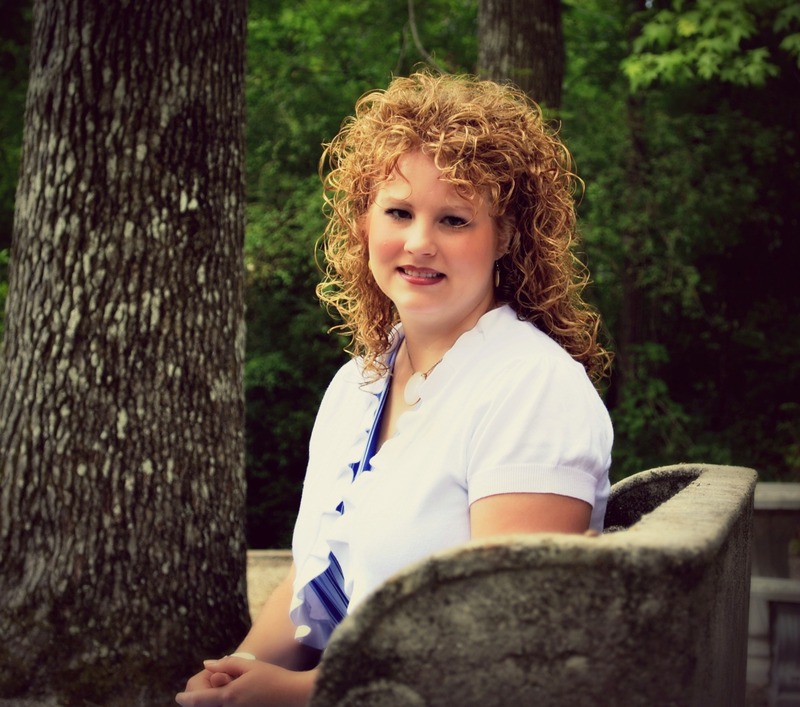 Jessea Knight recently posted..5 Habits that will change your life. It is all so pretty! Great ideas! 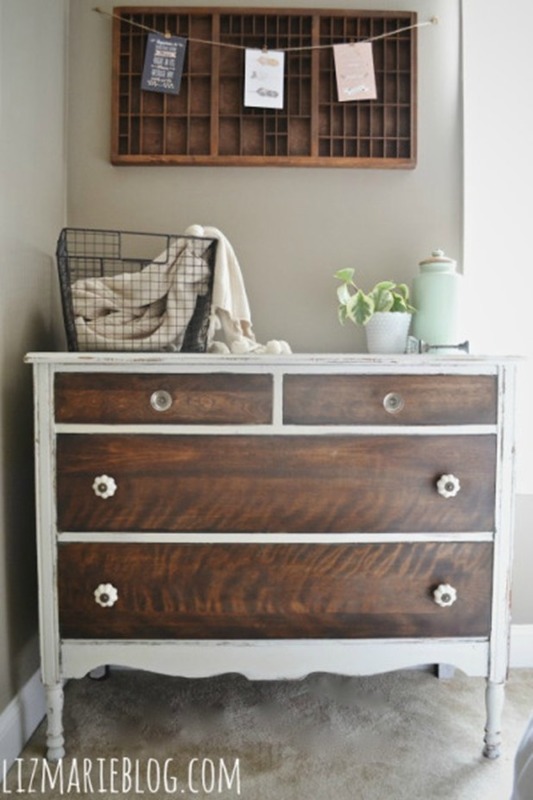 I would stain both the tops and drawer fronts of the furniture and maybe go with chalk paint in the paris gray color for the sides, etc. 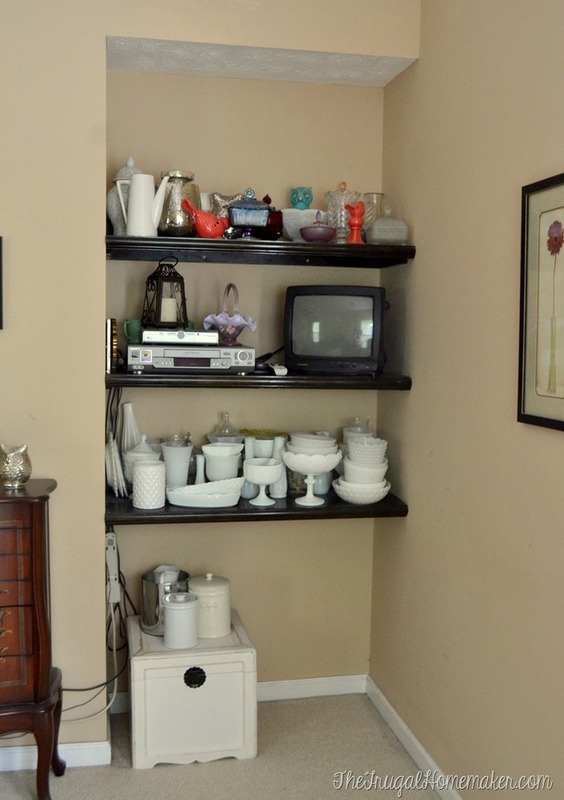 I would go the easy route and just have shelves all the way to the floor in that corner with some big baskets for linens, etc. I think it would look best to use two different nightstands, but not the one that came with the other furniture, which to me, would look too matchy. Can’t wait to see how it all comes out! 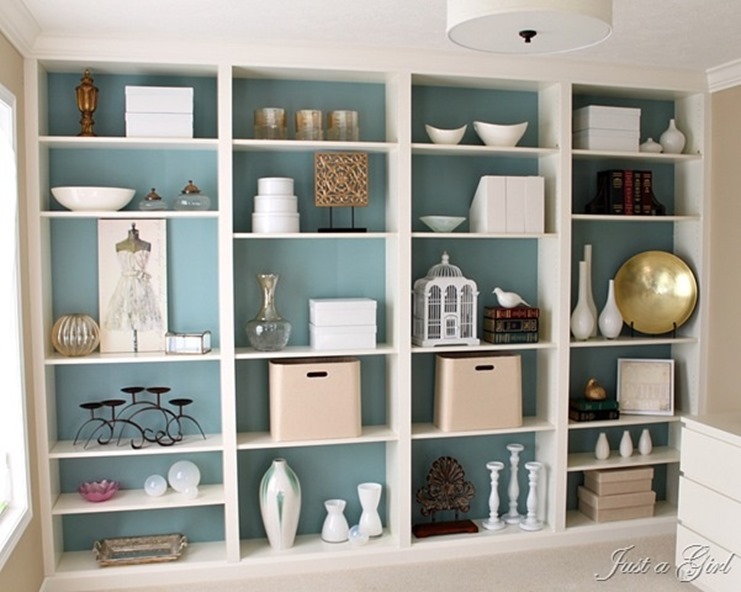 Have you checked Lowe’s or Home Depot for cabinets that you could place under your open shelves? This would solve the issue of the hinges. 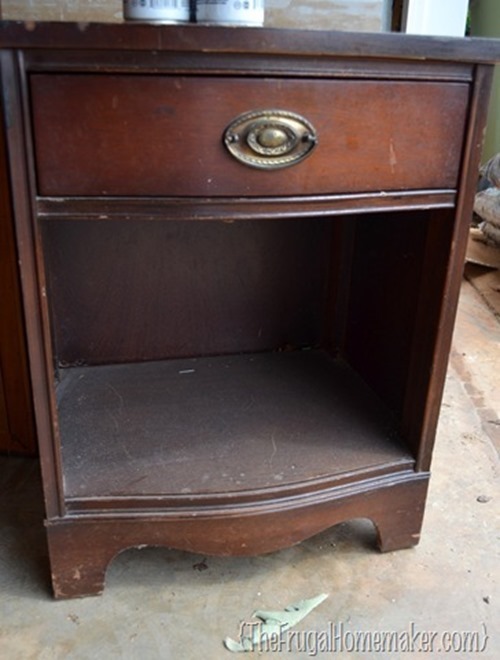 I think the stained top and white bottom, including drawers is lovely and a bit more classic. Seems like that would better go with the rest of your home. We did – looked at Home Depot last week. Need to check online at Lowe’s. But chepeast was almost $100 and that just isn’t in the budget. 🙁 But great suggestion! Bummer! 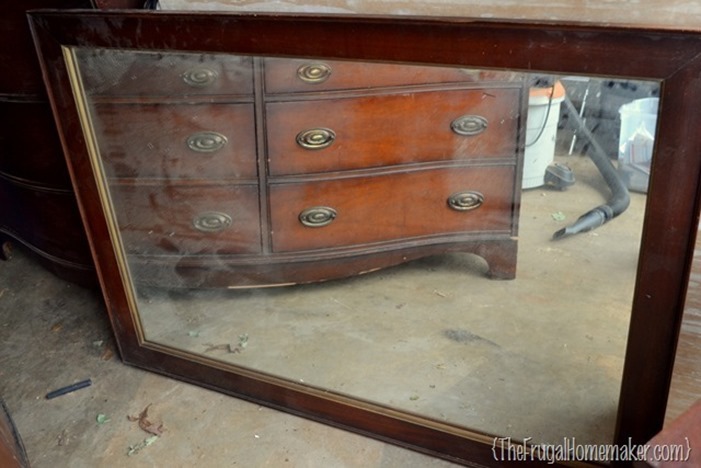 Are you close to a Restore? I see stuff in mine from time to time, but have never tried looking seriously for something specific. It will be fun to see what you create.